For Te Puke dairy farmer Murray Linton understanding the science of growing grass is one of the drivers for joining Tiller Talk. As part of the project an agronomist, along with other farmers, will discuss opportunities for improvement on Murray’s farm throughout the year. Murray, who has 10 years’ worth of growth rates, is a fan of data. 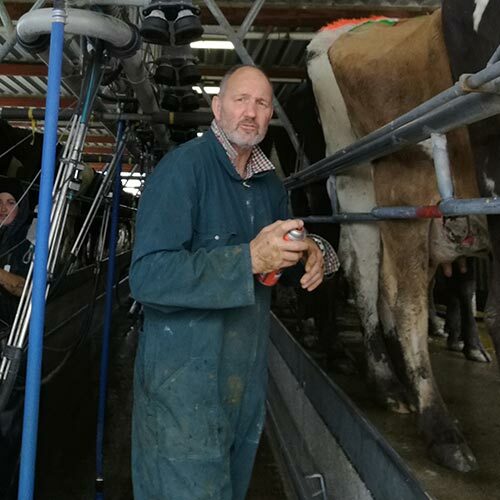 Murray milks 480 cows on the self-contained 176 ha farm (effective) in Te Puke, which has been in the family for more than 70 years. The farm is hilly to steep, a challenging contour that brings Murray to put cows on once a day from Christmas time every year. He is passionate about learning, which is why he’s supporting his two full-time workers to study through Primary ITO. Tiller Talk will help cement on-farm what Tayla Keane and Jen Russ learn in class by particularly looking at the science behind different decisions. Murray and his team are clear on the goals for the farm. “Key non-negotiables for me are to have an educated team and keep farm environment safe. I also very much like the stock being cared for and have a nice, quiet shed,” says Murray. Well-fed cows, but also high growth and high utilisation of pasture are key drivers for any decision making, says Murray. He sees the biggest opportunity for the farm is to grow more grass. Some of the challenges he will need to overcome include a difficult soil type and a change in stocking rate next season. “With less cows on-farm from next season, we anticipate making more silage, hence we need to be on top of pasture surplus throughout spring and that includes ensuring quality silage is made,” says Murray. Pasture renovation is another area of interest. “Due to the contour of our farm we have a lot of area we can’t cultivate. We are looking for methods to maximise our sidling’s through fertilizer, grazing management, pasture species and pasture replacement methods”.